Stargazing: What Hardware Do I Need for Astrophotography? Stargazing through binoculars or a telescope is hugely rewarding, but imagine if you could capture stunning images of what you see to share with the world. Astrophotography awaits, and with recent developments in equipment, amateur stargazers are beginning to obtain images that rival those that were possible with professional telescopes only decades ago. Camera tripod: A tripod allows you to fix your camera to a solid base so that you don’t have to hold it in your hand. If you take exposures much slower than 1⁄60 second, then the image becomes blurry because your hands shake, no matter how still you think you’re holding the camera. Camera cable release or remote control: A cable release or remote control allows you to take images without touching the camera, which also helps reduce camera shake and image blurring. Most cable releases or remote controls allow you to lock the shutter open, meaning that you can start the image and leave the camera for the duration of the exposure. Range of lenses for your camera: If you’re hoping to catch very faint objects with your camera, then consider getting a hold of a very fast lens – one in which you can open the aperture as wide as possible, which allows your camera to collect more light. Fast lenses, such as f/1.2 or f/1.4, can be very expensive, but the images you get are amazing. Another useful lens is a fish-eye. These fish-eye lenses have huge fields of view, so they’re great if you’re hoping to get a wide-angled shot with a lot of stars in it. Telescope with a camera-mounting bracket: Many telescopes, like the one in the figure. come with a mounting bracket that lets you piggyback your camera on the body or mount of the telescope, basically letting you use your telescope as a very expensive tripod! Telescope with motorised star tracking drive: If your telescope has a motorised tracking drive, then you can afford to make much longer exposures of objects in the sky, without getting star trails. 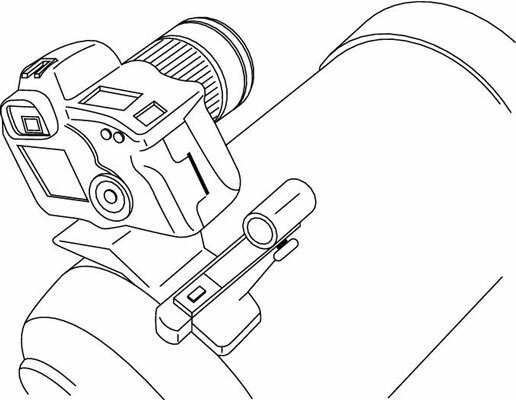 Telescope with eyepiece adaptor: For serious astrophotography of the planets or of deep-sky objects like galaxies and nebulae, you have to attach your camera to the eyepiece socket of your telescope. You’ll need to get a special adaptor that fixes onto your camera in place of your camera lens and then slots into the eyepiece socket in place of an eyepiece. You essentially convert your telescope into one very powerful camera lens. If you plan on deep-sky astrophotography, then you’ll need long exposure times as well as a telescope that tracks the stars automatically. Filters: Astronomers often use filters to block out unwanted light. Filters that block out light pollution can enhance your image a great deal, but you may find other filters are better for the image you want to capture.